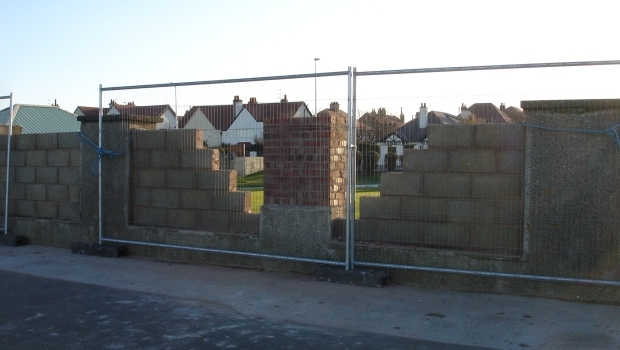 Promenade Gardens Get Bricked Up. There’s work currently being undertaken at the Promenade Gardens that doesn’t really look that attractive. The remaining wooden fence panels are being removed, the brick pillars are being repaired but breeze blocks are replacing the fencing. I know the area takes a complete hammering from the wind and some of the fence panels were in poor condition but the blocks look awful. There’s been some graffiti on the existing brickwork for some years …you have to wonder if some fresh wall will encourage more of it? I’ve no idea if the Hoylake and Meols regeneration plans have progressed at all (hard to see were the money will be coming from in the current economic climate), but some form of improvements would be welcome. 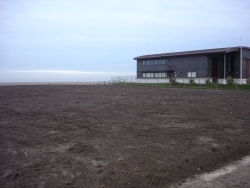 Elsewhere in the vicinity the remaining ground to the left of the new lifeboat station was re-landscaped over the Christmas break. From what I’ve noticed though the grass is going to have a tendency to hold water so it may be often muddy. By the way, have you seen the station at night when it’s glowing red inside (it’s the halogen heaters I guess)? Gives the building a slightly mysterious look. And finally, we’ve lost a bench along the front – something or someone has smashed one near to the shelter at the bottom of Clydesdale Rd. Hopefully the blocks will be pebbledashed over. I see no room for sitting any more, there used to be maroon painted wooden slatted seats in each alcove out of the wind when i was a kid. Yes, my mother (bn. 1909) called them the “recesses” ( dict. :- an Alcove) and admitted that they were the popular place for a bit of slap and tickle in her courting days. OoooErr mother! Sadly, in the 70s and 80s I knicknamed this part of the prom Dog T**** Alley as dog walkers never seemed to clean up after their dogs. Wow what a packed beach. I hope it will be again. I am thinking of getting the Beach Mission started again. any thoughts appreciated. 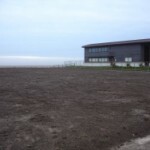 I know that an elderly man from Hoylake Evangelical Church at the roundabout used to run it and as I was a team member at the Cricieth Beach Mission for several years I thought it would help to regenerate the use of the prom. Also wouldn’t it be great to have the old Lifeboat station made a listed building.